Monopartite, linear, ssRNA(+) genome of about 4 kb, which lacks a poly(A)tail. Has a 3? cap-independent translational enhancer (3?CITE). The virion RNA is infectious and serves as both the genome and viral messenger RNA. Two 5'-proximal ORFs are directly translated to produce the viral constituents of the replicase complex. RdRp is translated through suppression of termination at the end of ORF1. 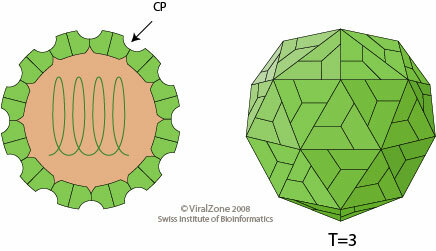 The downstream genes encoding the movement protein, viral suppressor of RNA silencing (VSR) and capsid proteins are translated from subgenomic RNAs. The RdRp recognizes internal subgenomic promoters on the negative-sense RNA to transcribe the 3’co-terminal subgenomic RNAs that will generate the capsid protein, movement protein and viral suppressor of RNA silencing (VSR). TRANSMISSION Not infectious by leaf rub inoculation.